Three children suffered through a nightmare of torture at the hands of John Kluth and Sonja Kluth pictured above. 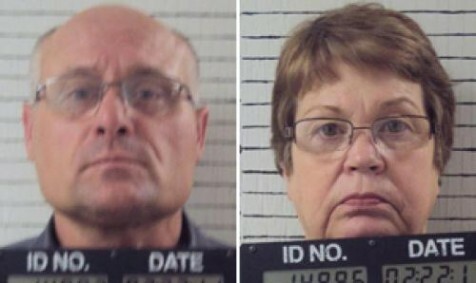 Three adopted children were reportedly burned, beaten, fed dog food, and abused by John Kluth, 50, and Sonja Kluth, 57, of Yukon, Oklahoma, and are charged with three counts of child abuse and three counts of child neglect. The couple confined a 15-year-old boy to a plastic dog carrier for two months and would not allow him to eat. The couple was released on $9,000 bond and their phone number was changed. Sonja Kluth told police that she lost control of the children and had become a “monster”. All three have stunted growth, the sheriff of Canadian county Randall Edwards said. He called it the worst case of abuse he had ever seen. The oldest boy said their tongues were burned with a hot spoon for lying. Two children also had smashed fingers and scars all over their bodies. The girl reported Sonja Kluth choked her and beat her with a mop and broom. The oldest boy said the woman would tell him “get back up here, you know I want blood,” during the abuse, police said. The three children were from Wisconsin originally and were adopted by the Kluths and moved to Oklahoma, where the Kluths continued receiving $1500 a month for childcare from The Wisconsin Department of Children and Families. The Wisconsin Department of Children and Families gave no comment on the case. The biological children of the couple says that they were using the children to receive child adoption assistance money.